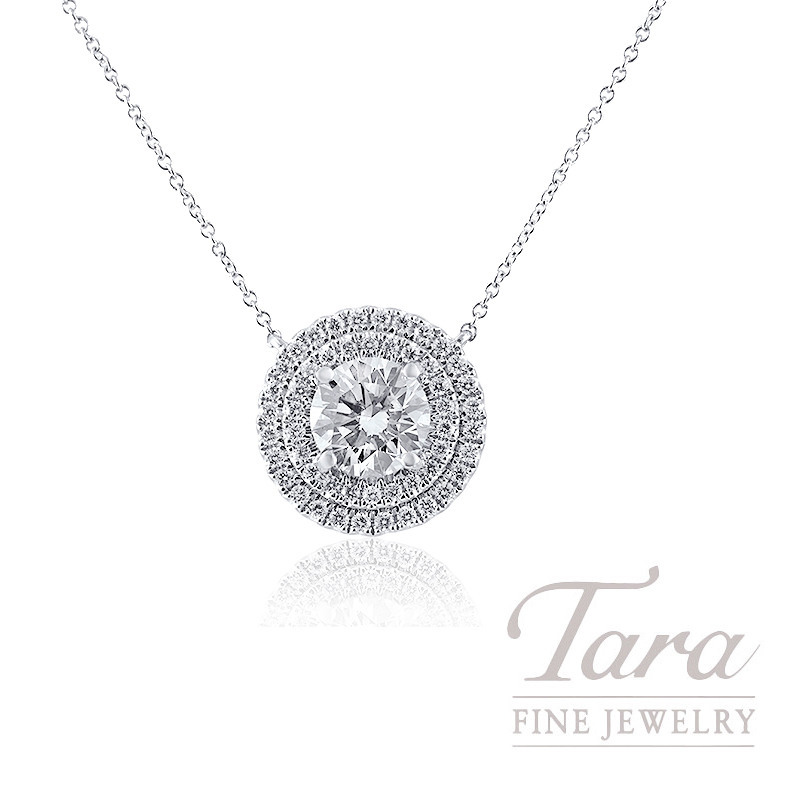 Find the most beautiful Diamond Necklaces and Engagement Rings Atlanta has to offer at Tara Fine Jewelry Company, Atlanta’s Jeweler that specializes in quality Diamonds and fashion-forward fine jewelry. The perfect illustration of glamorous beauty, who wouldn't adore this luxurious A. Jaffe 18k White Gold Double Halo Forevermark Diamond Pendant! Tara Fine Jewelry Company, Atlanta's jewelry store, is an authorized retailer for A. Jaffe Jewelry and Forevermark Diamonds, and this incredible piece of art brings together two of the most prestigious designer lines in the fashion world! The necklace showcases a wondrous A. Jaffe Pendant Mounting made from shimmering 18k White Gold. This glorious mounting flaunts the show-stopping beauty of a Double Diamond Halo design that parades a total of 50 round twinkling Diamonds at .41TDW. In the heart of the piece, you will find a jaw-dropping 1.51CT K-VS1 Round Brilliant Forevermark Diamond. You've never seen glamorous beauty until you've seen and worn this sensational A. Jaffe and Forevermark Diamond Necklace! Tara Fine Jewelry Company, Atlanta's Jeweler, is where you will find the most beautiful Diamond Necklaces and Engagement Rings Atlanta could offer. Our incredible selection of custom jewelry and designer fashion makes us the best jeweler in Atlanta. Visit Tara Fine Jewelry Company today to see the most beautiful selection of jewelry from Forevermark, A. Jaffe, Ritani, and more. Tara Fine Jewelry Company, Atlanta's jewelry store for over 30 years!